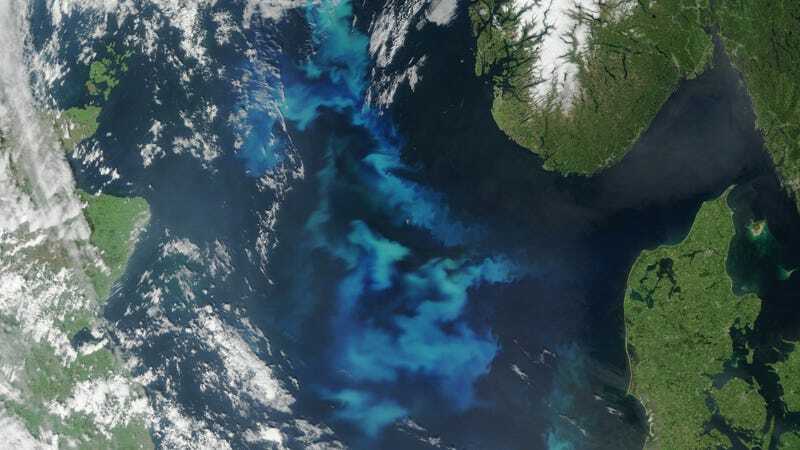 Every summer, the population of algae in the North Atlantic reaches a peak, with the blue-green color of the phytoplankton causing the ocean to visibly change, even from space. NASA’s aptly-named Aqua satellite captured the above image on July 1st using its Moderate Resolution Imaging Spectroradiometer instrument. You can see Norway on the right, the UK peeking out from under the clouds on the left, and a beautiful algal bloom right in the middle of the North Sea. The milky, light-colored surface waters are likely filled with coccolithophores, whereas the greener areas are probably rich with diatoms or perhaps dinoflagellates. (It is impossible to know for sure without water samples.) Colors are more intense and vivid in places where concentrations of phytoplankton are highest, which should match where nutrients like nitrates, phosphates, iron, and sulfur are most abundant and water temperatures are ideal. The patterns traced by the phytoplankton also give some insight to the currents and eddies in the area. As Scientific American explains, the annual algal bloom really starts in mid-winter, when turbulence in deep water makes it harder for algae to be eaten, causing an increase in the population. The growth peaks in spring, and by summer, organisms that feast on algae have caught up to the growth rate, returning the North Sea to its usual, depressing grey color.